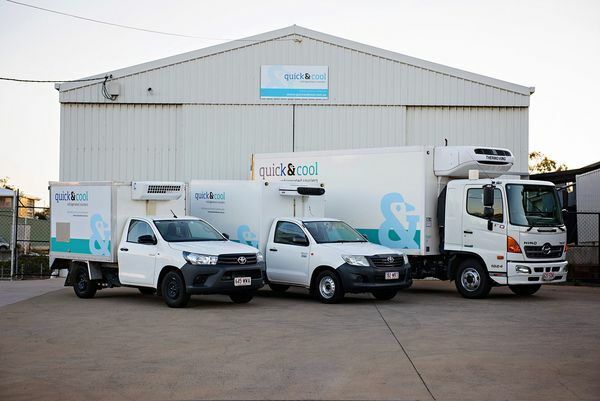 Quick and Cool are a leading refrigerated transport company that specialise in the delivery of food goods to the hospitality, health and education sectors throughout South East Queensland. We deliver daily within our service area as well as complete urgent and Saturday deliveries upon request. To ensure food safety, our vehicles and systems are SafeFood Queensland accredited. Based in Toowoomba, we have daily services to and from Brisbane and the Gold Coast, servicing all locations in between, including Ipswich, and the Lockyer Valley. We also service outer Toowoomba areas such as Allora, Clifton, Warwick, Pittsworth, Oakey, Highfields and Crows Nest. Transport is also arranged to Dalby, Chinchilla, Goondiwindi and further west and south. For your convenience, we have cold storage facilities in Toowoomba and Brisbane and we can store and transport refrigerated goods to temperatures as low as -20 degrees celsius. Our fleet of refrigerated delivery vehicles is equipped with temperature monitoring and real time GPS tracking. Our staff have also been vetted and authorised to conduct deliveries to Australian Military facilities. In addition to being refrigerated courier experts, we understand the food service industry. We see ourselves not just as members of the logistics industry, we are the ‘last mile’ specialists in the delivery of valuable food products and produce to its final destination and end users. Our staff take pride in being the ‘face’ of the clients that they are delivering for and are committed to giving excellent customer service and representing your business. We deliver your refrigerated and frozen goods with care and confidence.